alaTest has collected and analyzed 114 reviews of Vivitar 12.1MP with 2.7 TFT Digital Still Camera (DVR947-RH-KHL). The average rating for this product is 3.4/5, compared to an average rating of 4.0/5 for other Camcorders for all reviews. People are impressed by the design and portability. The price and usability are also mentioned favorably, whereas there are some mixed comments about the size. There are some critical opinions about the color and battery. We analyzed user and expert ratings, product age and more factors. Compared to other Camcorders the Vivitar 12.1MP with 2.7 TFT Digital Still Camera (DVR947-RH-KHL) is awarded an overall alaScore™ of 78/100 = Good quality. alaTest has collected and analyzed 18 user reviews of Vivitar 12.1MP with 2.7 TFT Digital Still Camera (DVR947-RH-KHL) from Amazon.co.uk. The average user rating for this product is 3.7/5, compared to an average user rating of 4.0/5 for other Camcorders on Amazon.co.uk. People really like the usability. The price also gets good feedback. 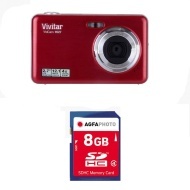 alaTest has collected and analyzed 26 user reviews of Vivitar 12.1MP with 2.7 TFT Digital Still Camera (DVR947-RH-KHL) from Amazon.com. The average user rating for this product is 2.4/5, compared to an average user rating of 3.9/5 for other Camcorders on Amazon.com. Reviews about the design and portability are on the whole positive. The price and usability also get good opinions. There are some mixed comments about the size. There are some critical opinions about the battery and memory. 42% of the reviews on Amazon.com give this product a positive rating. alaTest has collected and analyzed 4 user reviews of Vivitar 12.1MP with 2.7 TFT Digital Still Camera (DVR947-RH-KHL) from Amazon.ca. The average user rating for this product is 4.3/5, compared to an average user rating of 4.1/5 for other Camcorders on Amazon.ca. This is my third Cannon Point and Shoot "take everywhere with me" camera; which is very easy to use. This camera works great, easy to use and takes real good pictures. And the video recordings are awesome too. This little camera is quite a good one for a decent price. Pictures are excellent quality and its so easy to use its insane. I recommend to someone looking for a simple camera that can take high quality pics or one that does most everything for you. The 24x zoom is great, easy to use. Bought it for myself after I bought my wife a D5000, after using the P90 she took it and gave me the D5000. I bought this camera to take photos of my daughter playing sports. And it was an excellent choice. It takes awesome photos inside or outside. I would definitely recommend it to all my friends.